Women have increasingly played a significant part in the unionized workforce in recent decades. In 2009, almost half (46%) of unionized workers were women, compared with 38% in 1989. John Schmitt makes a point that at this rate, women will exceed the share of men in the unionized workforce by 2020. Zeroing in on the matter, CEPR occasionally looks at a more specific group of workers represented by unions. For example, here, we seek to examine women in one of the fastest growing ethnic groups in the U.S. workforce, the Asian Pacific Americans. Almost half (48%) of unionized Asian Pacific Aamerican (APA) workers were women, and 13% of APA female workers were unionized. On average, unionized APA women were better educated (57% had a college degree or more) and slightly older (49% were age of 45 or older) than unionized APA men. A higher share of unionized APA women were employed in public sector (47%) or worked part-time (16%) than unionized APA men. 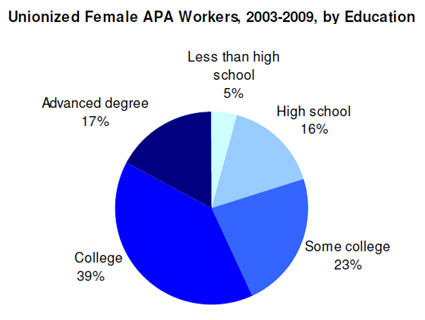 APA women in unions were highly concentrated in the Pacific states, especially in California (46%) and Hawaii, (12%). About 1/5 were in the Northeast states. 69% of APA women workers in unions were immigrants. These findings were somewhat unsurprising as the patterns shared similarities with the unionized female workforce as a whole. The regional distribution of unionized APA workforce reflected the distribution of the overall APA workforce. One notable finding, however, is the fact that there was a high participation of immigrant APA workers in unions. Given that only about 12% of overall women workers in unions were immigrants, it is striking to see that among APA women workers in unions, more than 2/3 were immigrants. Take a peek also at a CEPR's previous report on APA workers released last November by John Schmitt, Nicole Woo and myself. The paper examines the demographic composition of APA workers both for the unionized and non-unionized workforce. More importantly, it takes a further step in analyzing the effects of unionization on wages and benefits for APA workers. Unionization not only raises APA workers' wages (by 9 % or about $2.00 per hour), but also raises the likelihood of having health insurance and a pension plan.